When you get a cool new gadget like the Kindle Fire, it generally a good idea to get some kind of protective cover or case for it. It is hard to find good ones that aren’t super expensive, but there are some good options available in the Kindle Store to take advantage of. 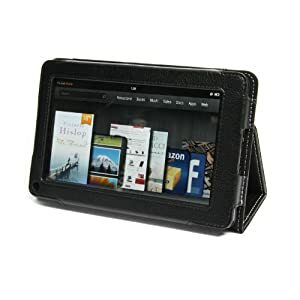 There is one case currently on sale for $29.99 called the Kindle Fire Lightweight MicroShell Folio Cover. It comes in four colors and it props the tablet up for hands free viewing. 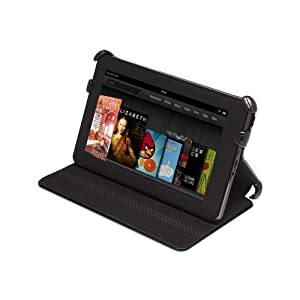 Reviewers describe this case as the “most bang for your buck.” The part I like the most about it is that it props the Kindle Fire up fairly high, which makes it so much easier to use. It also provides much sturdier support than just propping it on a stack of books. The colors available are black, graphite, pink, and white. I hope more will be added soon, especially blue, since that is my favorite color. Also for the same price as the MicroShell case, you can get a Kindle Fire Zip Sleeve made by Amazon. It does have good padding for protection against scratches and a decent choice of colors, but it doesn’t have as much functionality as the MicroShell case. There are versions of the sleeve for all Kindle models. I think the reviews for the Kindle Fire Lightweight MicroShell Folio Cover are great for the most part especially the newer reviews.